Over at the World of Tanks forum, there have been quite a few debates over the merits of the German WWII medium tank “Panther.” No vehicles seems to illicit the range of opinions as the Panther does, and judging from how heated the debate often becomes, people are emotionally invested to a surprising degree in this particular piece of military equipment. One of the more interesting posts on the topic is in the “Chieftains Hatch” section of the forum, it details a postwar report by the French in regards to the Panther tanks they used in the late forties. This report includes the rather interesting facts that half of all Panther tanks found abandoned in the Normandy campaign were due to failed final drives and that in French service, the final drive only lasted on average 150km. I thought it might be an interesting exercise to go through some of my books and post snippets that pertain to Panther reliability. It seems that in the forums people often argue without providing sources or repeating the same source over and over. This list should provide people with a mosaic of information regarding the Panther’s reliability (or lack thereof), particularly in regards to the final drive and engine life issues. According to a report written by Guderian on March 5, 1944, the constant improvements to the Panther tank series resulted in some positive feedback from the user community. He wrote that one Panther tank-equipped unit on the Eastern Front stated that they felt their tank was far superior to the Red Army T-34 medium tanks. They went on to report that all the early mechanical difficulties that had so bedeviled the early production units of the Panther tank had been ironed out of the design. As roof, they offered the fact that service life of the tank’s engine had gone up to 435 to 621 miles (700 to 1,000 km). In addition, the same Panther tank-equipped unit reported that final drive breakdowns had ended and that transmission and steering gear failures were now within an acceptable range, which is damning with faint praise. The factories building the Maybach HL230 P30 engine began a program of derating the engine to 2,500 rpm at maximum load in November 1943 in order to prolong its life span. The derating of the Panther tank engine dropped the maximum listed speed of the vehicle from 34 mph (52 km/h) to 28 mph (45km/h). It also lowered the maximum engine output to 700 to about 580 horsepower on the Panther. the success of this effort was mixed; a British Army report in June 1944 reported that a German POW had stated that the engines in one Panther battalion had an average life span of only 450 miles (724 km). Problems were experience with blown head gaskets. As advised by Dr. Ferdinand Porsche, this was corrected by installing copper rings pressed into grooves to seal the heads of Maybach HL 230 P30 motors starting with serial number 8321466 in September 1943. Other modifications were introduced at the same time including improved coolant circulation inside the motor and a reinforced membrane spring installed in the fuel pump. Maybach HL 230 P30 motors with numbers from 8321812 to 8322581 and motors that were rebuilt in October and November 1943 had faulty bearings that frequeintly failed. Improved bearings were installed in HL 230 P30 motors starting with serial number 8322581 in November 1943. Starting in March 1944, a new piston design was installed in the Maybach HL 230 P30 motors, reducing the compression ratio from 1:68 to 1:64. Final Drives Improved: In September and October 1944, a series of modifications were incorporated int o the final drives as countermeasures to reported problems including chewed up gear teeth, broken parts, damaged bearings, and insufficient lubrication. The Panther initially experienced numerous automotive problems with required a continuous series of modifications to correct. These problems can be traced to three main causes: leaking seals and gaskets, an overtaxed drive train originally designed for a 30 metric ton vehicle, and an untested engine. But, following modification of key automotive components, with mature drives taking required maintenance halts, the Panther could be maintained in a satisfactory operational condition. Mechanical Deficiencies in the Chassis: Most mechanical failures were defective fuel pumps (20 in Panzer-Abteilung 54 by 8 July). Fuel collected on the floor due to fuel pump leaks and resulted in the total writeoff of three Panthers due to fires. When on the steep side slope, the Panther easily catches on fire. In most cases, the motor fires were extinguished by the crew or the automatic fire extinguisher system activated. Motor failure: During this period, motor failures were abnormally high. Pazer-Abteilung 52 already had 12 defective motors by 8 july. After several days, the number of break-downs decreased. Therefore it is speculated that the motors were not sufficiently run in. Transmissions: Transmissions didn’t experience a high number of breakdowns. the transmission modification at Grafenwoehr were apparently successful. by 8 July, Panzer Abteilung 52 had experienced 5 transmission failures. Motor: The cylinder head gasket burns through. connecting rode broke. Oil pump driveshaft broke. Final Drives: Special bolts for the large drive gear in the final drives shear off. Also, housing plugs that are not spot welded often fall out, causing oil leaks. Oil also leaks out between the cover plate of the final drive housing and th hull side. the bolts that fasten the final drive to the armor hull work loose. Cooling Fan Drive: the upper bearing for the ventilator seizes. butrication is deficient even though the specified oil level is correclty shown. Damage is caused to the cooling fan drive which at the same time often damages the fan clutch. Driveshaft: bearings are pushed out toward the motor side. the mounting for the hydraulic pump drive gear is torn off. Maybach HL 230 P30 Motors: In general, the new motors have significantly longer lifespan the first series. The longest distance achieved by the motor is 1700 to 1800 kilometers in 3 of the 7 Panthers that are still available. The motor failures that did occur were all the same nature, bearing damage and broken connecting rods. Oil leaks from the valve covers due to poor gaskets. The oil drops on the hot exhaust where it ignites. In several cases, a heavy overflowing from the carburetors was noticed.The spark plugs became wet and didn’t fire. The unburnt fuel was then discharged to the exhaust header and leaked through the gaskets. This caused fire to spread on the outside of the motor. Transmissions: The transmissions also achieved an increased lifespan. However, in several cases the 3rd gear failed at about 1500 km so that a new transmission needs to be installed. The damage maybe caused by overtaxing the 3rd gear during the muddy period that lasted almost a quarter year. Since there was no chance to obtain new transmission, three Panthers with damaged 3rd gears remained in action and still succeeded in traveling an additional 250 km. In this case, the driver had to shift from 2nd to 4th gear. In several cases the main clutches were damaged during the ong muddy period and head to be replaced. The longest distance driven without transmission failure is 1500 km to 1800 km by four of the 7 Panthers that are still available. The large play in the steering gear may also be traced to extensive driving in mud. Because of the comparatively complicated adjustment of the steering mechanism and short technical training, in all cases the drivers can not be expected to correctly adjust the brakes by themselves. Since in most cases, Panthers with steering problems must remain in service, this results in final drive damage and increased brake wear. Final Drives: A very large percent of Panthers broke down through damage to the final drives. As an example, since the first of March, 13 final drives were replaced in 30 Panthers, more on the left than the right. bolts on the large gear inside the final drive shear off. Final drives can not hold up to steering in reverse in heavy soil. Tracks and Suspension: At about 1500 to 1800 km, the tracks are very heavily worn. In many cases the guide horns are bent outward or broken off. In four cases the tracks had to be replaced, since a complete row of guide horns broke off. Over revving the motor especially when driving uphill and during combat in heavy soil! Steering in reverse (which can’t be avoided during combat). On 28 June 1944, Guderian reported on experiences in opposing the Allied landing in Normandy: The Pz.Kpfw.IV, V, and VI have proven to be successful. The Panther appears to catch fire quickly. The lifespan of the Panther’s motors (1400 to 1500 km) is significantly higher than the Panther’s final drives. A solution to the final drive problem is urgently needed. The fasteners for the Schuerzen must be strengthened to prevent them from being torn off by the hedgerows in the Normandy. Soon the troops will demand that protective armor shields be mounted over the rear decks because of the success of fighter-bomber attacks. The height of the guns in the Strumgeshuetz is too low for the terrain in Normandy. The general consensus of the industry was that inner-toothed gear wheels could not be produced due to a lack of proper machinery. This meant that a final drive using planetary gear reduction and pre-selector spur gearing – found to be reliable in company testing – could not be installed in the production tanks. All attempts to improve the final drive met with failure, despite the offers of a special bonus as an incentive. The housings, which initially had proven too weak and whose outer mounts had been bent out of alignment by the track’s pull, were eventually replaced by stronger ones. Soon after the introduction of the Panther Ausf. D into service, the steering unit exhibited reliability problems. After the war, German tank designers told their British captors that they were well aware of this defect. Their defense of the steering unit design was based on the belief that the steering brakes would outlast a vehicles transmission and final drives. Hence, it was not the serious problem to the Germans that the British portrayed in their report. During World War II, a German prisoner of war informed his British captors that the weakness of the Panther’s steering mechanism was well known. Panther tank drivers were instructed to use the auxiliary skid brakes for steering and to avoid pivot steers. He went on to say the steering unit problem appeared to be result of the overloading of the steering clutch during tight-radius and pivot steering maneuvers. British engineers concluded that Panther final-drive units had inadequate bearings and poor housing strength. IN addition, critical areas of some gears were not hardened properly. these and other major design and manufacturing defects lead to poor final-drive reliability. Later information revealed that the Germans had approached a French firm during the war years to investigate the practicality of producing a new type of final drive for the Panther tank. The French received the assembly drawings, but nothing ever came of the proposed project. “My understanding is that the final drives were always a problem. I’ve heard different things, for instance, that [the Germans] couldn’t get the proper alloy, they couldn’t heat-treat it properly, or whatever. When we test ours, the alloy and the strength of these particular gears was as good as what you could make them from today. [We] looked at maybe duplicating them, using the same physical size, but just using a stronger alloy or better treatment, and the answer we got back was that it was as good then as we can do it now. Part of the problem with the final drives was no doubt due to the vehicle’s growth in weight. It grew in weight from its original goal of 30 to 35 tons to the low 40s. I’m going to guess that what ended up happening with the final drives is that they were designed for the lower-weigh vehicle, and there wasn’t the physical size [available] to where you could make the gears wider and stronger. Since they weren’t able to make them wider, they just left them the way they were originally designed. Although the Panther’s AK 7-200 transmission was nominally superior to the clumsy transmission on the t-34, about 5 percent broke down within 100km and over 90 percent within 1500km in combat. The final drive on the Panther Ausf. D was so weak that the tank could not even turn while it was backing up, which occurred frequently in the retreat to the Dnepr River. It’s two fuel pumps were probably the biggest mobility weakness in the Panther Ausf. D because they were prone to leaks and caused serious engine fires. As least three Panthers were destroyed by fuel pump-caused fires during Zitadelle, and a high proportion of the mechanical breakdowns was caused by this troublesome component. Nor did the problem go away after Kursk: the initial batch of Panther Ausf. A tanks what were handed over to the SS-Leibstandarte in Italy in September of 1943 were so problematic that every one was rejected for service. The Panther’s poor mobility forced the Wehrmacht to move units around by rail and get them as close to the front as possible before unloading. Throughout 1943, the Panther was essentially tied to conducting all major movements by rail, including the equally short-legged tiger, and units could not even move 100km without significant losses. Thus, the Panther did not meet Guderian’s requirement for a tank with superior mobility, and it was the t-34’s continued advantage in mobility and reliability that contributed greatly to the Soviet victory in the Ukraine in 1943. Although the Panther had the potential to emerge as one of the great tanks of World War II, the first version, which debuted at Kursk in summer 1943, suffered appallingly poor reliability. On average, only one-quarter of the Panther Ausf. D tanks deployed in the panzer regiments in 1943 were operational at any given time. 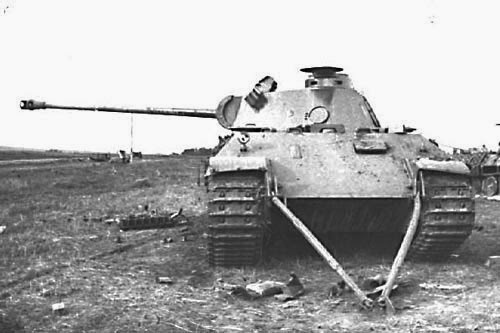 While technical difficulties are not unusual in any new weapon system, the Panther was worse than average. This situation gradually improved through the course of 1943 as specific shortcomings were rectified. the Panther’s operational rate rose from an appalling 16 percent at the end of July 1943 to the merely wretched rate of 37 percent by December 1943. An improved version, confusingly called the Panther Ausf. A, entered production in August 1943. This version standardized improvements that had been gradually introduced into the Panther Ausf. D and included an improved turret with a new commander’s cupola. Additional changes continued to be incorporated into the design through 1943 and into 1944. These improvements began to have an effect on the availability rate of the tanks deployed on the Eastern Front, going from the 37 percent in February to 50 percent in April and 78 percent by the end of may 1944. It is interesting to note that the British 6th Guards Armoured Brigade captured Panther “Cuckoo” was acquired having been abandoned with a supposed transmission fault but was eventually taken out of service from Brigade due to a gearbox failure and no accessible spares……. Thank you for these great sources. Gives a lot better picture than the biased BS floating all around the internet. What were the most advanced weapon systems during WW2?